This document will guide you through assigning or publishing our client software to specific users or computers by using Group Policy in Windows Server 2008. It is expected that you have already created and populated a user group containing the users or computers requiring access to the software. Place them in a folder on a server and make sure the folder is accessible to the appropriate users and/or computers by applying suitable sharing permissions to it. Make a note of the folder's "Network Path" as you'll need it later, it will be something like \\server_name\shared_folder. 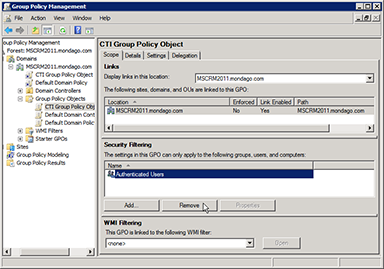 Log in as the domain administrator using one of the Windows Server computers connected to the domain and start the "Group Policy Management Console". Note:instructions and screenshots are based in Windows Server 2008. You can start it from the Windows "Start" menu (Start > All Programs > Administrative Tools > Group Policy Management) or via the Windows Control Panel (Control Panel > Administrative Tools > Group Policy Management). In the console tree, navigate to the correct domain, then right-click on the "Group Policy Objects" option and click "New". Enter a name for your new object, leave "(none)" selected in the "Source Starter GPO" dropdown and click "OK". Your new object will appear in the "Group Policy Objects" section of the console tree. Click the "+" icon to expand the section if you cannot see your new object. You need to link your new group policy object to the right domain. In the console tree, right-click on the appropriate domain in the "Domains" section and then left-click on the "Link an Existing GPO…" option in the pop up menu. 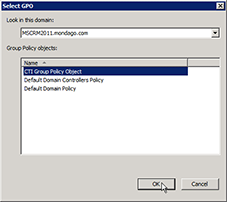 The "Select GPO" window will open and list the group policy objects it finds within the domain. 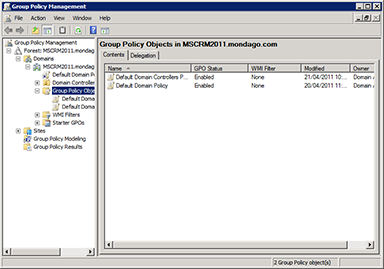 You should be able to see the new group policy object you created so select it and click "OK". 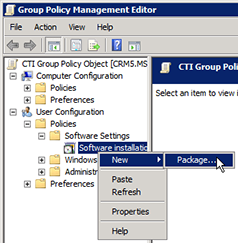 Right-click on your policy object in the console tree and click "Edit…" to open the "Group Policy Management Editor". In the console tree's "User Configuration" section, expand "Policies" and then "Software Settings". Right-click on "Software installation", then left-click "New" and then "Package…". 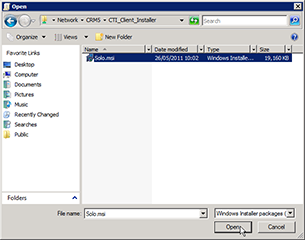 You need to type the full Universal Naming Convention (UNC) path of the client software installer package folder into the "Open" dialog box and this is where the "Network Path" you noted down earlier gets used. Do not use the "Browse" button to navigate to the folder. If you do, the wrong naming convention will be used. Once you have typed the UNC in, you should see the UCClient.msi file listed so select it and click "Open". The next screen has three options for how to deploy the client. Selecting "Advanced" gives you the most control over the software's deployment so we suggest you use this one. The most commonly used options are found on the "Deployment" tab. You can choose between a published deployment and an assigned deployment in the "Deployment type" group. Selecting "Published" gives the user a choice of whether to install the software or not. Selecting "Assigned" ensures the software is automatically installed i.e. the user does not have a choice. It is also important that the "Install the application at logon" option is selected. 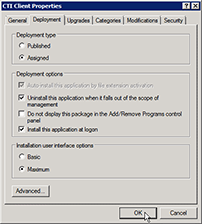 You may wish to alter some of the others settings under the "Deployment options" group. Click "Apply" to accept your advanced settings. Click "OK" to continue once you have made your choice. When you create a new group policy, it is automatically applied to the "Authenticated Users" group so you need to remove this group. In the "Security Filtering" section, select "Authenticated Users" and click "Remove". Once removed, click the "Add" button (next to "Remove"). This will open the "Select User, Computer, or Group" window. In the "Enter the object name to select (examples)" text area, start to type the name of the group you want to assign the group policy to. Once you have typed a few characters, click the "Check Names" button to display a list of objects that contain the characters you have typed. Find and select the object you require and then click "OK". Depending on your Windows configuration, you may need to "enforce" your group policy. Enforcing it ensures that it is not overruled by another group policy so it is recommended that you apply it to your policy if you can. To do this, find your group policy in the appropriate domain's section of the console tree, right-click it and select "Enforced" from the pop up menu. Please note that your group policy is listed twice, once in the root folder of your domain and again in the "Group Policy Objects" subfolder. You need to right-click the listing that is in the root folder, not the "Group Policy Objects" folder. That's the end of the setup process on the server. However, each user in the group will need to perform two further actions when they next log in to force the group policy into action. Otherwise the group policy may not be initiated immediately by Windows but at randomized intervals to balance server load. When gpupdate has completed its task, users should reboot their computers. The client software will now be available to install or use immediately when the computer restarts. Once the client software has been deployed to the relevant machines then it is possible to deploy any relevant user settings from UCADTool. Please refer to the separate UCADTool guide for how to complete this. IMPORTANT! When selecting TAPI dialing the client must have been run as an Administrator on each machine and TAPI dialing will not be activated until the machine has been rebooted.